The mission of the Hagerstown Church of the Brethren is to celebrate the love of Jesus Christ and glorify the Lord by striving to live as Christ lived, experiencing the power of God's healing in our lives. We seek to nurture our faith community through prayer, music and the proclaimed Word, while enthusiastically reaching out to others with compassion, respect and love for everyone so that we may grow in faith and commitment together. With humble beginnings in a Potomac Street fire hall in 1883, to a store room near Market House in 1884, the congregation grew, moving into a chapel on East Washington Street in 1884. By 1893, 120 people were worshipping together regularly. In 1897, a new brick church was built at the current location. An educational wing with a social hall and stage was added in 1930. The church was remodeled in 1977. In June 2014, the church welcomed co-pastors Tim and Audrey Hollenberg-Duffey, who held close ties to former and current members and an interim pastor. 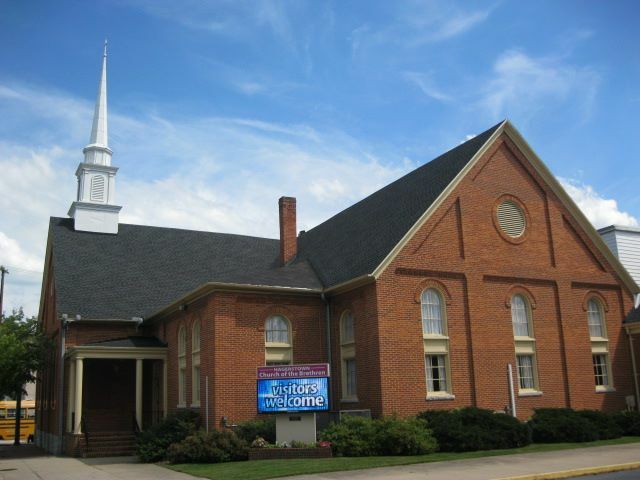 They host two worship services each Sunday, Contemporary Worship at 9 am and Traditional Worship at 11 am with Sunday School for all ages at 9:45. Use the links on the right for more information and check our our Facebook page at www.facebook.com/hagerstowncob/.